In 2014, James Gunn's Guardians of the Galaxy forced five unlikely allies and criminals together and saw them transform into proper heroes. In 2015, Guardians of the Galaxy fans have watched, re-watched, and re-re-watched the movie hundreds of times and now are patiently waiting the sequel. However, the Guardians movie compared to its comic book source material was fairly sparse. The comics not only told the story of these cosmic avengers but opened up a large part of the Marvel universe with off-earth stories. As it stands, the GoG team was much larger so for the sequel, Gunn has plenty of new and interesting people to bring in, and that's not even counting all the other interesting characters NOT on the GoG team. 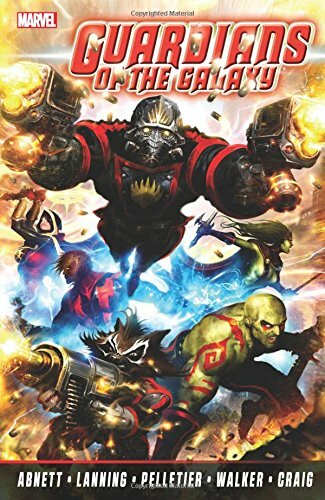 For those that don't fancy exploring the Guardians world in the Dan Abnett and Andy Lanning comics, here's a quick taste of some of the characters you will definitely want to see make an appearance in Guardians of the Galaxy 2. Adam Warlock is pretty much a shoe-in for the sequel as it is through his storyline that another Infinity Stone is introduced into the world and...Well, he actually made a cameo in the first movie. Within The Collector's base, Adam Warlock's cocoon can be seen in the background (confirmed by Gunn himself). While he was born in a cocoon created by The Enclave that was seeking to create the perfect human, it is likely that this was the cocoon he formed around himself to escape earth after having a brief confrontation with Thor. Regardless, it will be interesting to see how (or if) they handle his back story in the movie, but Adam Warlock brings some extremely powerful quantum magic to the table. It's something that will definitely be needed if the Guardians intend to tangle with Thanos. Plus, his future self (Magus) would make for another good movie. The GoG team is lacking in female heroes as it stands now, so it is looking pretty good that Mantis might be a nice addition to the team. She is a telepath and martial arts master that locates the physical weak points on her opponents in order to take them down. In the comics, Mantis is used in Peter Quill's plan to bring this band of antiheroes together by using a little forceful motivation and that nifty ability to partially look into the future. If the movies begin to explore time travel like the comics did, her abilities would be a handy little plot device. The question is though, can the group dynamic in the movie handle another strong green lady character? Meet Vance Astro, the founder of the original Guardians of the Galaxy team from the 1968 comic series. He was sent back in time after some wild schisms in the space-time continuum. In the comics, Peter Quill and his team meet him on their first mission. He sits frozen in time holding Captain America's shield. He wears an anti-aging Adamantium space suit and might serve as another fun displaced human playmate for Starlord; however, if the franchise goes on his importance as the founder will definitely assure him a spot. Unfortunately, it's unlikely he will show up in the sequel as more than a cameo. His busted timeline story really deserves a movie all its own. You can't help but to love Bug. He's a real C-lister as a super hero, but a fun character and great for a little of that comic relief that GoG utilized so well. In a movie with a now-tiny talking tree and a snarky racoon, why not a giant silly bug man, right? Aside from being a big green locust with superhuman strength and a rocket lance, Bug doesn't have much else going for him. He spent most of his run in the comics complaining about how Starlord didn't recruit him earlier. Jack Flag's appearance in the Marvel universe is looking pretty bright considering The Avengers are approaching that fun Civil War debacle where Jack Flag makes his first appearance. While helping Captain America, he is paralyzed and imprisoned by a team of super villains working with Iron Man at the time. Spending most of his time in a wheelchair, the GoG team are able to repair his back in an outer space prison battle where he joins up. Although Jack Harrison, under his new alias Jack Flag, only has some super strength, he is very much a regular human. He uses a similar costume and blasters like Starlord and would certainly be another relatable human for Peter Quill. Unfortunately, the sequel might be too soon to expect this patriotic badass. You know how in the movie the sole mission of Drax the Destroyer is to seek revenge against those who killed his wife and daughter? Well, wouldn't it be fun if his daughter isn't actually dead? Moondragon, a bald beauty not unlike Nebula, is just that. After escaping Thanos as a little girl, she grew up on Titan, shaving her head, developing psionic powers, and learning to turn into a massive dragon. You know, usual kid stuff. When she joins the Guardians of the Galaxy team there are daddy issues abound and a certain moral murkiness that just begs to be on the big screen. She is also notorious for having romantic relationships with characters all over the Marvel universe, so there's that. The sequel could use a few more animals, especially if they aren't especially put there for the purposes of being comic relief. Cosmo is a former test animal for the Soviet Space Program. During his space flight, he drifted off course and mutated into a telepathic super mongrel. Eventually landing on the Knowhere Space Station (and getting a job as security chief), Cosmo meets the Guardians and joins up, playing a major part to their overall storyline. Who doesn't want a cute doggie in the mix anyway? He could play fetch with Groot and chase Rocket out of the trash. Although the Nova police force was introduced in the first movie, viewers never got to see any proper Nova centurions or other officers that sport more traditional super powers. When one of these Nova officers crash lands on earth, he passes on his powers upon dying to average snarky earthling Richard Rider. What's an earth teen to do with increased strength, speed, flight, invulnerability and blaster hands than become a stand in the Nova Corps for the officer that died. He goes on to be a pretty big deal too, his arc is easily one of the most fun in the GoG storyline. There's no better time to start reading the comic series. I mean, what's more fun than letting your inner comic book elitist run wild in your friend's ears after the sequel premiere? Nothing. That's what!